A tour of the world in eighty days? Jules Verne should like nothing better! Phileas Fogg, having shut the door of his house at half past eleven, and having put his right foot before his left 575 times, and his left foot before his right 576 times, reached the Reform Club, an imposing edifice on Pall Mall, which could not have cost less than three million. He repaired at once to the dining room, the nine windows of which open upon a tasteful garden where the trees were already gilded with an autumn coloring, and took his place at the habitual table, the cover of which had already been laid for him. His breakfast consisted of a side dish, a broiled fish with Redding sauce, a scarlet slice of roast beef garnished with mushrooms, a rhubarb and gooseberry tart, and a morsel of Chester cheese, the whole being washed down with several cups of tea, for which the Reform is famous. He rose at forty-seven minutes past noon and directed his steps toward the large hall, a sumptuous apartment adorned with lavishly framed paintings. A flunky handed him an uncut Times, which he proceeded to cut with a skill that betrayed familiarity with this delicate operation. The perusal of “The Thunderer” absorbed Phileas Fogg until a quarter before four, while the Standard, his next task, occupied him till the dinner hour. Dinner passed as breakfast had done, and Mr. Fogg reappeared in the reading room and sat down to the Morning Chronicle at twenty minutes before six. Half an hour later several members of the Reform came in and drew up to the fireplace, where a coal fire was steadily burning. They were Mr. Fogg’s usual partners at whist: Andrew Stuart, an engineer; John Sullivan and Samuel Fallentin, bankers; Thomas Flanagan, a brewer; and Gauthier Ralph, one of the directors of the Bank of England, all rich and highly respectable personages, even in a club which comprises the princes of English trade and finance. “But have you got the robber’s description?” asked Stuart. “In the first place, he is no robber at all,” returned Ralph, positively. It was Phileas Fogg, whose head now emerged from behind his newspapers, who made this remark. He bowed to his friends, and entered into the conversation. The affair which formed its subject, and which was town talk, had occurred three days before at the Bank of England. A package of banknotes, to the value of 55,000 pounds, had been taken from the principal cashier’s table, that functionary being at the moment engaged in registering the receipt of three shillings sixpence. Of course he could not have his eyes everywhere. Let it be observed that the Bank of England reposes a touching confidence in the honesty of the public. There are neither guards nor gratings to protect its treasures; gold, silver, banknotes are freely exposed, at the mercy of the first comer. A keen observer of English customs relates that, being in one of the rooms of the bank one day, he had the curiosity to examine a gold ingot weighing some seven or eight pounds. He took it up, scrutinized it, passed it to his neighbor, he to the next man, and so on until the ingot, going from hand to hand, was transferred to the end of a dark entry; nor did it return to its place for half an hour. Meanwhile, the cashier had not so much as raised his head. But the present robbery was not accomplished quite so easily. The package of notes not being found when five o’clock sounded from the ponderous clock in the “drawing office,” the amount was passed to the account of profit and loss. As soon as the robbery was discovered, picked detectives hastened off to Liverpool, Glasgow, Le Havre, Suez, Brindisi, New York City, and other ports, inspired by the proffered reward of two thousand pounds, and 5 percent on the sum that might be recovered. Detectives were also charged with narrowly watching those who arrived at or left London by rail, and a judicial examination was at once entered upon. There were real grounds for supposing, as the Morning Chronicle said, that the thief did not belong to a professional band. On the day of the robbery a well-dressed gentleman of polished manners, and with a well-to-do air, had been observed going to and fro in the paying room, where the crime was committed. A description of him was easily procured and sent to the detectives; and some hopeful spirits, of whom Ralph was one, did not despair of his apprehension. The papers and clubs were full of the affair, and everywhere people were discussing the probabilities of a successful pursuit; and the Reform Club was especially agitated, as among its members was the deputy governor of the bank. Ralph would not concede that the work of the detectives was likely to be in vain, for he thought that the prize offered would greatly stimulate their zeal and activity. But Stuart was far from sharing this confidence; and as they placed themselves at the whist table, they continued to argue the matter. Stuart and Flanagan played together, while Phileas Fogg had Fallentin for his partner. As the game proceeded the conversation ceased, excepting between the rubbers, when it revived again. Inventing the Aztec calendar, detail from the Codex Borbonicus, sixteenth century. Bibliothéque Du Palais Bourbon, Paris. “It was once,” said Phileas Fogg, in a low tone. “Cut, sir,” he added, handing the cards to Thomas Flanagan. “Be so good as to play, Mr. Stuart,” said Phileas Fogg. “In eighty days,” interrupted Phileas Fogg. “All included,” returned Phileas Fogg, continuing to play despite the discussion. 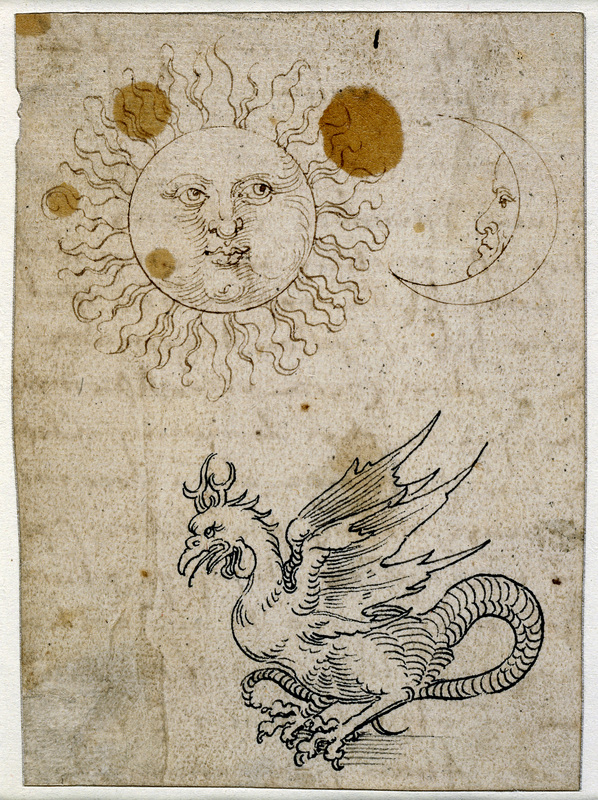 The Sun, the Moon, and a Basilisk, by Albrecht Dürer, c. 1512. British Museum, London. “The unforeseen does not exist,” quietly replied Phileas Fogg. “We accept,” replied Messrs. Stuart, Fallentin, Sullivan, Flanagan, and Ralph, after consulting one another. “This very evening?” asked Stuart. A memorandum of the wager was at once drawn up and signed by the six parties, during which Phileas Fogg preserved a stoical composure. He certainly did not bet to win, and had only staked the twenty thousand pounds, half of his fortune, because he foresaw that he might have to expend the other half to carry out this difficult, not to say unattainable project. As for his antagonists, they seemed much agitated—not so much by the value of their stake as because they had some scruples about betting under conditions so difficult to their friend. From Around the World in Eighty Days. Verne as a boy in the 1830s liked to gaze at the ships in the harbor of his hometown of Nantes and the machines at a factory near his country house in Chantenay. “I have still as much pleasure in watching a steam engine or a fine locomotive at work,” he reflected later in life, “as I have in contemplating a picture by Raphael or Correggio.” As part of his Extraordinary Voyages series, Verne wrote, among some sixty works, Journey to the Center of the Earth and Twenty Thousand Leagues Under the Sea.